Recent adventures! I've been working on a series of larger figure pieces for our "Figure Show" which will open in May at the Knowlton Gallery in Lodi, CA. We just returned from a 10 day trip to Maui! Ray taught a 3 day workshop in the Kapalua and Lahaina areas. Just gorgeous! We also participated in the Maui Pleine Aire Event which was hosted by The Village Gallery. This event was run like a well oiled machine. Ray won the "Artist Choice Award" which we feel is a huge compliment. One is being judged by their peers. Saw this gorgeous rug in the lobby of the Ritz Carlton. Orientation was held at this beautiful resort. Weather was great. Did run into some heavy winds but there were plenty of places to paint and avoid it. And rainbows everywhere every day! Friday and Saturday Workshop in our studio. I just finished teaching a 2 day workshop in our studio at our home in Angels Camp. Had a great model. Cassidy usually models for the figure workshops and does a fantastic job. And joining us, a furry group of students! They all got along great! A very quick sketch to gather information on color and value. I'm taking the ceramics class again at our local community college. Am loving it! These are waiting to be glazed. There are figures all the way around so I can combine my drawing skills and ceramic skills. Can't wait to use my jewel tones glazes on them. It's always a surprise when they come out of the kiln. I went with Ray down to Laguna Beach a few weeks ago to play in his landscape workshop. I keep trying to get the landscape to speak to me but when it's just not going to happen I pull out my small gouache set up and do sketches of the painters in the class! So fun and speaks to me more clearly. Simple shapes, simple color, simple design. These are about 4" x 5". Will get the hang of landscapes someday. Working with our Value/Color System. Sometimes it's overwhelming to just figure out what to paint. But I know how much I want to paint and feel that brush against the canvas and love just painting relationships of color and value. 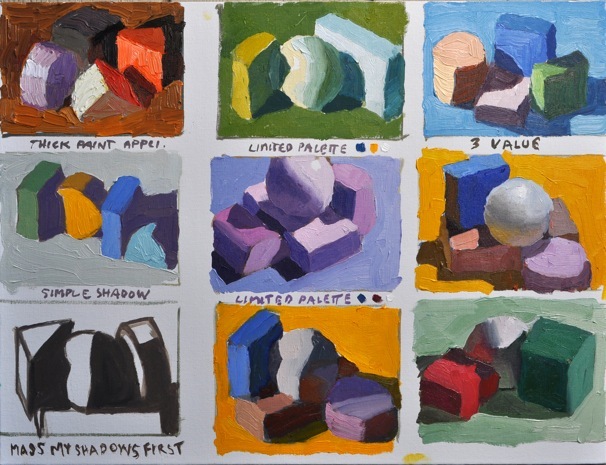 So just for the joy of painting I will use my Value/Color forms from our system and start painting. I don't worry about "will it sell", "will a gallery like it", "would so and so paint this"; all those thoughts that can sometimes stop me. And when I don't want the stress of those thoughts and just want to exercise my skills I paint from these forms and the 16 different drop cloths. 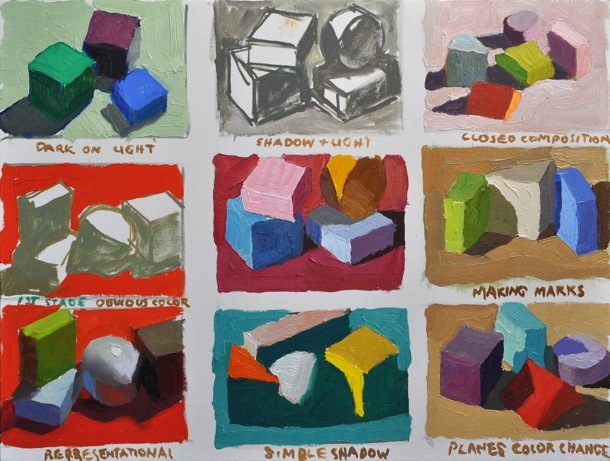 And many of the forms are color specific to my palette. The arrangements can be limitless. Have had so much fun!